Good grief! Your comments are all so great! It's so, so hard to choose. The one I just couldn't say no to was: "A monkey in a snowstorm playing a flute on a yak." Tessa, I Will Drawing That For You! Keep those fantastic drawing ideas coming. Feel free to revisit themes from your previous (non-picked) comments--there's been some really good stuff. I'm having fun, are you? Is this a good game? How does it compare to "Name That Dragon?" This is fun - I'm enjoying it even more than Name That Dragon. Lemming(s) singing opera, gummy bears taking over New York, or the computer virus from PBM eating a computer. A collage of all the books you've written/illustrated. The International Space Station being attacked by pirates. Ha! Alright, this is fun. We'll play. A crazy robot that has no brain jumproping on jupiter. A pink robot and she had so much fun that she called another pink robot and she had a fun idea to play. A cowboy dinosaur roping the city's buildings. Willy Wonka and his Umpa Lumpas battling an attacking horde of health nuts! Two dinosaurs competing to see which of them can make the biggest sandwich. I loved Name That Dragon, but this is even FUNNER! I'm still laughing at the image of gummy bears taking over new York (wish I had thought of that one) -- how about the tin man, lion, scarecrow and toto playing poker with the ruby red slippers in the pot and the wicked witch serving drinks. A super colorful fish flying through the air by some clouds. A giant magpie trying to grab the shiny sun. A lizard surfing on the clouds at sunset. This is fun! You have a lot of creative readers. Whatever name that dragon is, I want in. 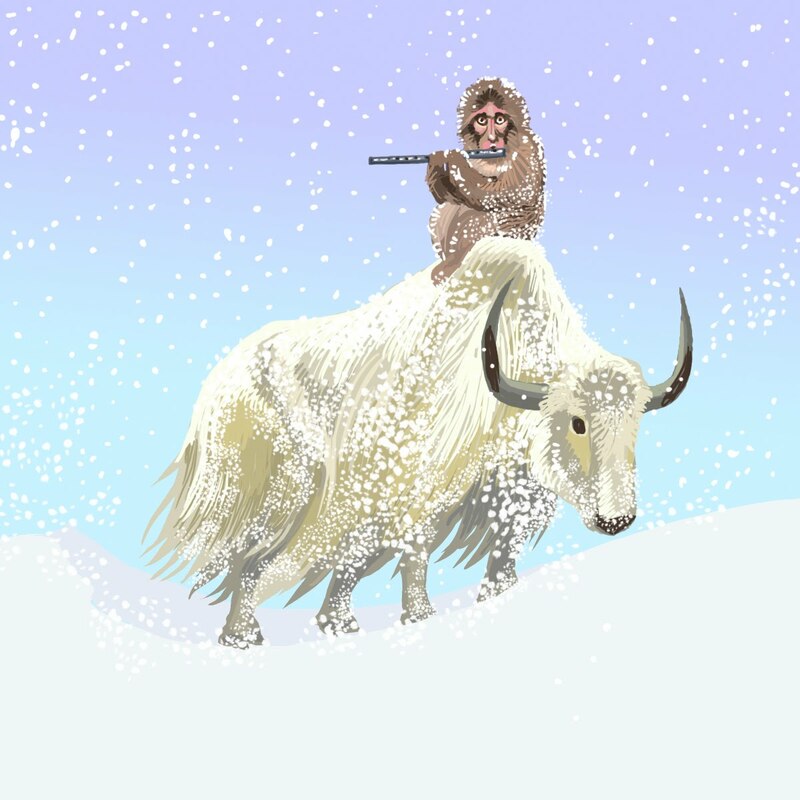 Yak is awesome. that's my favorite drawing so far. ummm, how about a yodelling cow in leiderhosen? maybe one playing a sweet accordian to accompany him....In the alps of course. Sugar gliders battling the kookaburra with slings and rugged swords! Yaks are always awesome! Here's one that our Max drew recently and we quite enjoyed. I'd love to see Nate stylings on it. A snowman, and a bunny on its face trying eat its carrot nose. The snowman is yelling, "Aah! Stop it!" I love the different styles of drawing - it's even better than Name That Dragon! How about drawing flamingos dancing around some weirded-out wombats. Love the snow. Love the game. idea: sea urchins playing "telephone"
How many bicycles can an octopus ride? This game is a lot of fun. Yes, even better than Name That Dragon. My contribution for today: a fire breathing hippopotamus. Yay! It was so fun to see Tessa's idea come to life with your drawing! We love it!